In helping people with serious medical problems, doctors depend on catheters to deliver medications, carry away bodily wastes and monitor vital signs. However, the very catheters that are so important to their patients’ health can themselves be infected by bacteria and become sources of serious and costly complications. Researchers at the Clark School, backed by funding from the Robert W. Deutsch Foundation, are developing tools that promise powerful new ways to combat catheter-based and other infections without provoking bacterial resistance to antibiotics. The challenge is enormous. According to Jeffrey D. Hasday, M.D., professor of Medicine and Head of Pulmonary and Critical Care Medicine at the University of Maryland Medical School in Baltimore, catheter infections are a major concern for intensive care unit (ICU) patients suffering from massive trauma, septic shock from pneumonia or urinary tract infection, or complications of cancer therapy. Such a patient may require not only a plastic tube in his airway to assist with breathing, but also a plastic catheter in his bladder to remove urine, in an artery to monitor blood pressure, in a large vein to administer life-sustaining medications, and sometimes another for hemodialysis. To offer physicians new treatments, Clark School researchers are pioneering a new approach for combating bacterial infections. Bacteria cells create an infection by communicating their presence to each other using a signaling molecule called autoinducer 2 (AI-2). At a certain point, the cells sense a “quorum,” which leads to the formation of a “biofilm” or mass of communicating cells—the first stage of an infection. A team of researchers from the Clark School and other University of Maryland units seeks to control cells’ quorum-sensing (QS) response so that the cells never perceive that they have achieved a quorum and fail to produce an infection. Bentley, with Assistant Professor Herman Sintim (Department of Chemistry), Professor Gregory Payne (Fischell Department of Bioengineering and Institute for Bioscience and Biotechnology Research), and Herbert Rabin Distinguished Professor Reza Ghodssi (Department of Electrical and Computer Engineering and Institute for Systems Research), and with Deutsch Fellow graduate students Mariana Meyer and Varnika Roy and chemistry graduate student Jacqueline Smith, has developed synthetic “analogs” of AI-2 called C-1 alkyl AI-2, with an ethyl version that strengthens the QS response, and a propyl version that quenches it. They have shown that their prototype drug can control QS response in a three-species synthetic ecosystem comprised of the bacteria E. coli, S. typhimurium and V. harveyi, working in the individual species and across the species. E. coli is a common source of infection in urinary catheters. One challenge in studying the interactions of bacteria is to assemble them in a controlled environment in which their activities can be monitored. Professor Gary Rubloff, Minta Martin Professor of Engineering in the Clark School’s Department of Materials Science and Engineering and director of the Maryland NanoCenter, with postdoctoral fellow Yi Cheng and other Deutsch Fellows, has developed a “hydrogel,” or water-based polysaccharide substance for this purpose. The hydrogel, when used with appropriate tools, permits researchers to assemble bacteria in ways that mimic the formation of a biofilm and apply stimuli and measure responses in three dimensions. "We use this mild, spatiotemporally controlled hydrogel assembly mechanism, together with a microfluidic, micro-electro-mechanical platform, to spatially evaluate the role of quorum- sensing autoinducer molecules and monitor biofilm development," said Rubloff. When a biofilm grows and thickens, it becomes less translucent. 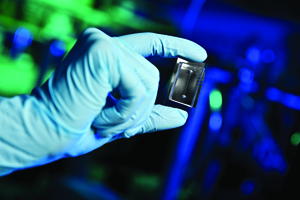 Clark School and other University of Maryland researchers are taking advantage of this fact to create a microfluidic “lab on a chip” that uses light to monitor biofilm formation and biofilm response to drugs such as C-1 alkyl AI-2. Working in conjunction with Bentley and Sintim, Ghodssi and Meyer have built a chip containing tiny channels into which fluids can be pumped under highly controlled conditions. On one side of a channel they place light-emitting diodes (LEDs) and on the other photodiodes that detect light. They pump fluid containing E. coli into the channel, and continuously shine light through it; as a biofilm grows, less light is captured by the photodiodes. They can then introduce a drug such as C-1 alkyl AI-2; if it interrupts the QS response, the biofilm begins to shrink and more light is detected by the photodiodes. In addition to improving development of drugs to combat infections, Clark School researchers are building sensors to detect, at very early stages, E. coli and other biofilms growing in catheters and implanted devices such as artificial joints. Early detection will permit physicians to apply drugs more rapidly, increasing chances that the infection can be defeated before it goes on to require extensive treatment. Ghodssi and graduate student Young Wook Kim have built and demonstrated a surface acoustic wave (SAW) sensor for real-time biofilm growth monitoring. The SAW sensor is an extremely thin piezoelectric film made of zinc oxide that may be placed on the surface of a medical device; when a biofilm grows on the film, the sensor’s resonant frequency changes, creating an electrical signal that the sensor transmits wirelessly to a physician or patient notification system. The sensor is highly sensitive and biocompatible and its operational frequency meets wireless medical device regulations set by the Federal Communication Commission. All of the research described here was initiated by a gift of more than $1 million from the Robert W. Deutsch Foundation. Deutsch Foundation funding enabled, for the first time, the integration of the necessary researchers and laboratories, and led to $2 million in research support from the National Science Foundation and $3 million from agencies within the Department of Defense. In order to continue the birth of innovative concepts and their translation to practice, the Deutsch Foundation, in 2010, provided another gift of more than $1 million in support of this pioneering research.